James Stokebrand leads by example. Lots of examples. Last year James Stokebrand, a computer engineer living in Chicagoland, discovered Ponoko and decided to create some lasercut business cards. The second cut fixed most of the problems with the first round, but the cards — made of 3mm black acrylic — were too thick. 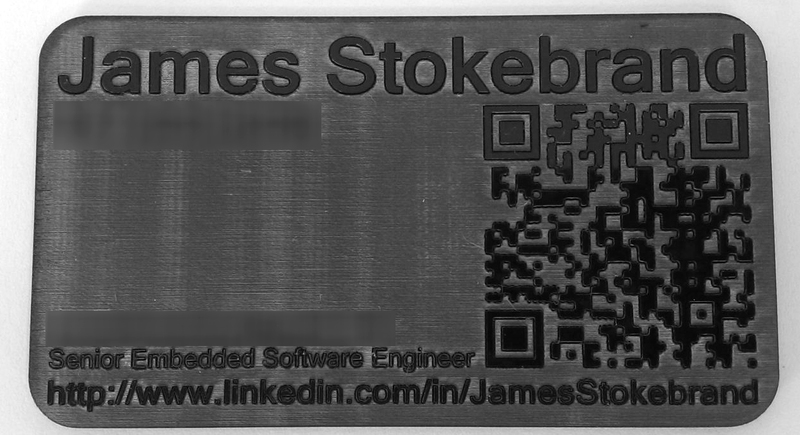 Fast forward a year, and James has come back to his lasercut business card design, which he’s calling Project Vanity on his blog Misadventures in Software. 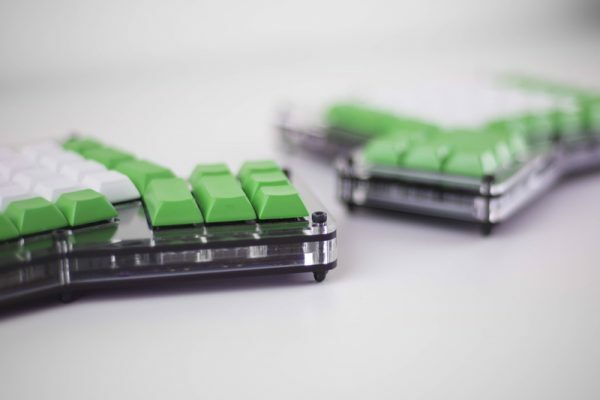 He tried out some different design layouts on clear acrylic which comes in thinner sizes. 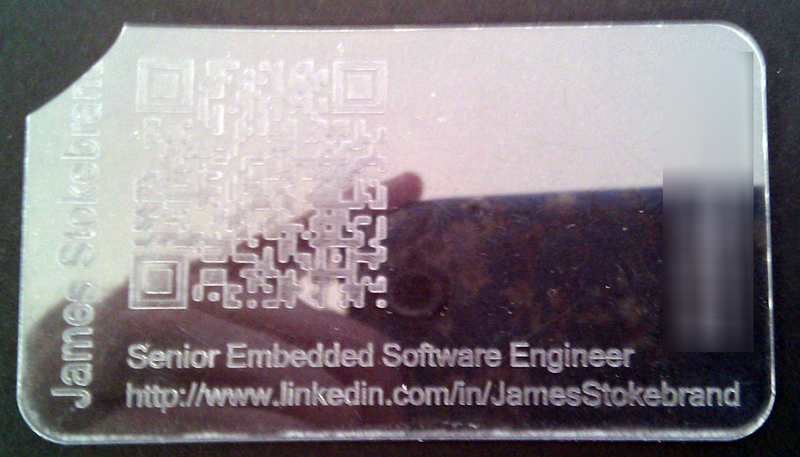 “Unfortunately, using clear acrylic makes it impossible to scan the QR code. 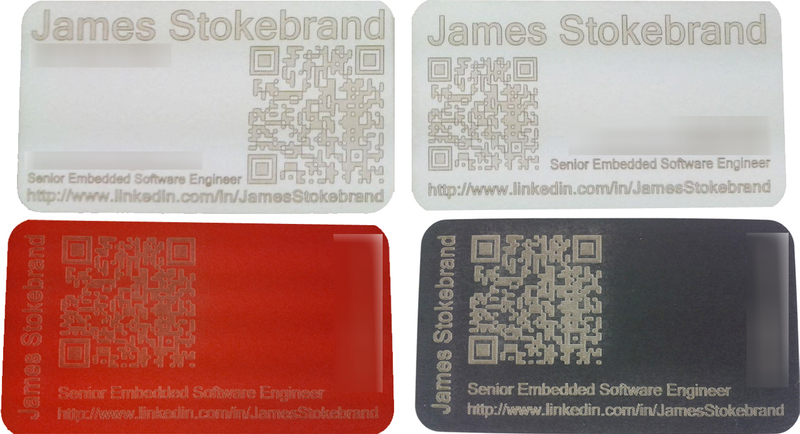 So for business cards, these make interesting failures,” James says. His next experiment turned out better, resulting in an embossed look by cutting away the background instead of the design. “The cards look great, but it took quite a bit of cleanup to make them presentable,” James notes. 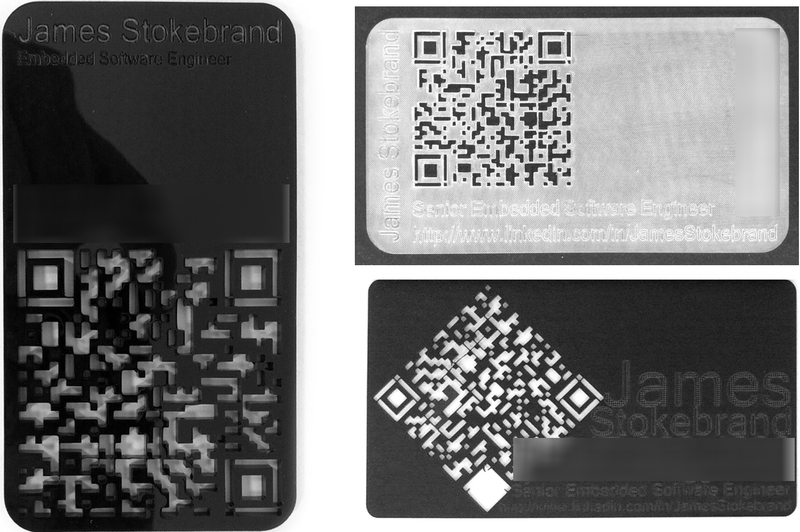 Then James came across the QR Code Stencil Generator, a program originally developed by the team at F.A.T. (Free Art & Technology) as part of a 21st Century update to hobo code communication. 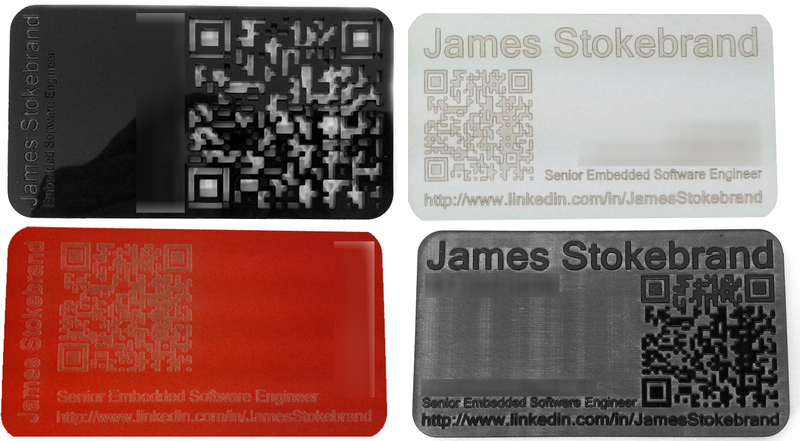 He used the Stencil Generator to make some new versions with the QR code completely cut out instead of engraved. 1) Always print the design on paper to ensure that its the correct size and configuration. 2) Round the corners of the card. Laser cut corners can be quite sharp. 3) Pay attention to text and graphic alignment. This is subtle but important to making a good design great. 4) Don’t forget to convert your text to Paths! 5) Never give up. Just because your first design may not be as good as expected doesn’t mean that it can’t be improved or updated. By the sound of it, there were issues with the acrylic, PETG, and cardstock? I’ve been looking for a material that would lasercut flexible stencils without too much melting. Any ideas? Was a fun story to read, thank you for sharing! 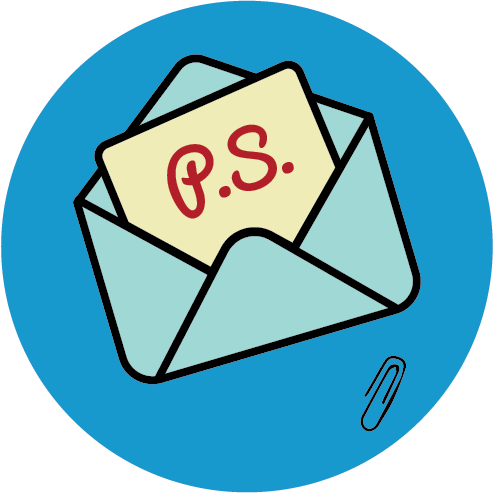 To create a business card of an appropriate size, a business card template can be used. Many printing companies have them on their websites. Or just measure a traditional card and create your own. 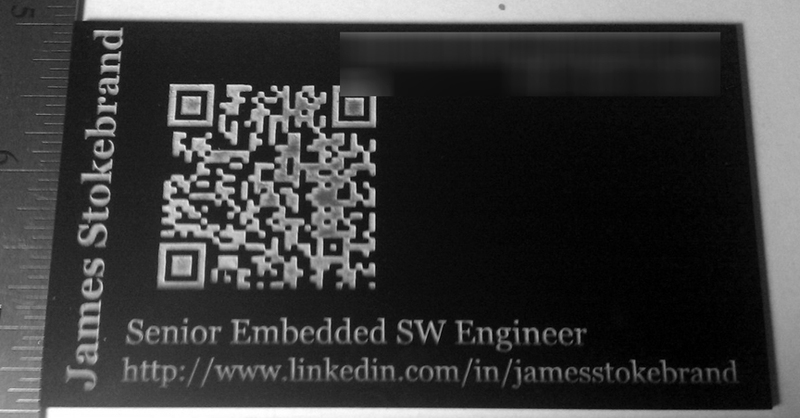 I actually had the same idea – to cut QR codes out, so I was glad to see that it works. The acrylic and cardstock materials are more britle materrials. The PETG is flexible but it seems to shear in ways that are annoying. Can you define what do you mean by “flexible”? Delrin makes WONDERFUL stencils. I have used it may times, especially the thinner materials. I use the white delrin, mostly the 0.125″ thickness (for flatness) but I’d imagine that even the 0.032″ thickness would work well. Delrin is flexible but doesn’t deform. It has a slick surface: even Sharpie permanent markers don’t stick to it. It’s a little more expensive than acrylic, but I only make one stencil and use it lots of times. Business cards would be cool, too. Maybe in black delrin. Yes, I understand now. You shouldn’t have any problems using acrylic or cardstock for the poseable figure design. Cardstock will probably be a little fragile for that , but acrylic will cut smooth if you don’t cut the details too small. The thinnest arylic material that Ponoko USA has is the 1.5 mm clear. Or you could use Delrin which has a 0.8 mm thickness. I’ve never tried to make a business card out of deltrin. When looking at the material samples on the Ponoko USA site, I didn’t think the text was as crisp and detailed compared to acrylic. I think that acrylic holds those sharp edges better and makes smaller details stand out. Thanks for the advice. I’ll have to give Delrin a try. I’d be afraid the acrylic might break and leave sharp edges. If Delrin is flexible and doesn’t deform under a laser, then it sounds like the right material for the job. Delrin makes nice stencils. I have used it may times especially the thinner materials. Out in Ponoko New Zealand they stock some great material for various kinds of stencils: 0.1mm Mylar. It doesn’t deform at all when laser cut, and is fairly durable as well. I use it for PCB Stencils (applying solder paste to a PCB) where extremely fine detail is required but involves metal tools scraping across the material. Works fantastically well. May do what you want as well.